You might be reading this article as someone completely new to the Vegas scene, or perhaps you’re a Vegas veteran who has dealt with all kinds of Las Vegas promoters and experienced the good, the bad, and the ugly when you got to the club. Either way you want to know where and how to find the best – to start off on a clean slate or maybe to avoid a guest list disaster of the past. To know the best, you have to know who you’re dealing with. There are all types of promoters and hosts in Las Vegas, all with different levels of power and respect at the club. What is the difference between a Las Vegas promoter and host? If you’re planning on going out in Las Vegas, one piece of lingo you should be familiar with is the difference between a promoter and a host at a nightclub. You’ll not only look cool to your friends, but you’ll be able to find the best people for the best purposes. What is a Las Vegas promoter? A Las Vegas promoter actually takes many forms. The most common are the logo-clad and uniformed soldiers peddling tickets for some of the bigger clubs like XS, Hakkasan, and Omnia. 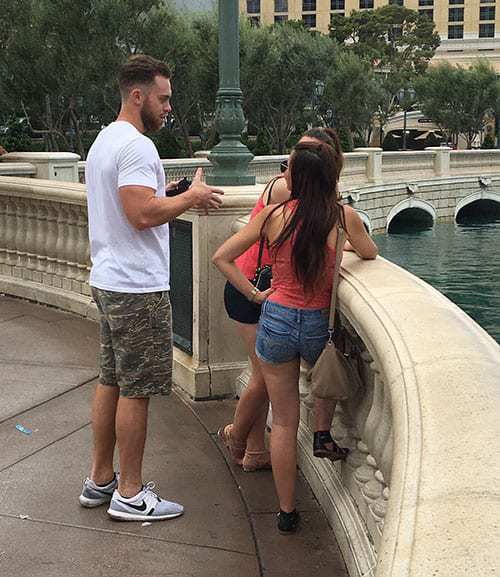 These clubs need thousands of people through their doors per night to “look full,” and to achieve that they employ armies of entry level promoters to search the streets of Las Vegas for willing girls and guys. 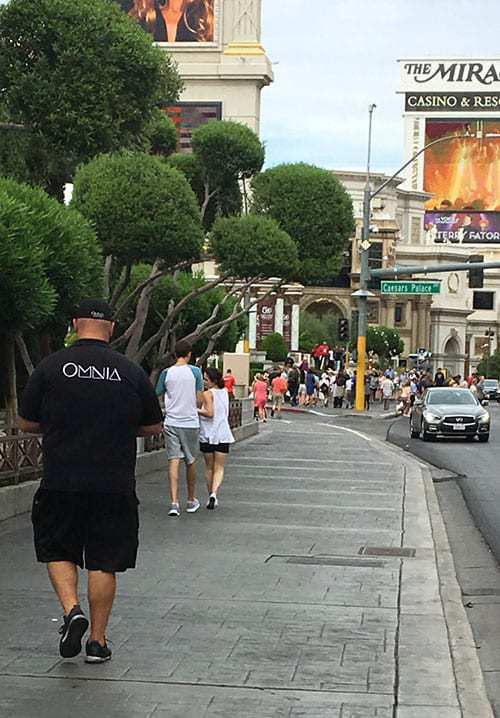 Las Vegas Promoters on the street face the daily strip grind. These promoters have a guest list each night and will add your name + the number of people in your party. They are usually given a “girls only” guest list. However, on less busy nights they open it up to girls and guys even ratio for free entry. 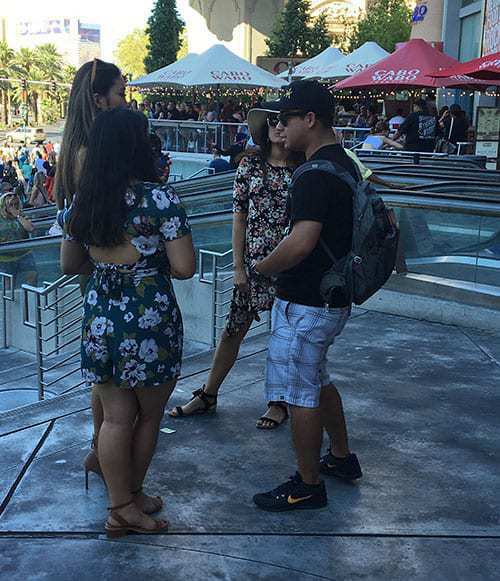 Las Vegas Promoters meet the tourists of the week on the strip. Some promoters actually are allowed in the club. These are the type you meet in plain clothes on the strip during the day. They usually look like they’re chilling out. They’re scoping out the scene and looking for a group they really want to talk to. A Las Vegas Promoter begins his pitch undercover. These are the Las Vegas promoters that have been given a bit more leeway by the nightclubs, and probably don’t have a distinct schedule or managers checking up on them. They produce and are more trusted than some of the newer guys. Talk about a dream job for most guys out there. These are promoters who have been selected to assist with seating comped “girl tables” and bringing girls to spenders inside the club. These promoters have a guest list (usually with special ability to “late add” and bring in after the list closes), but their primary job is the work they do inside the venue. Their main goal is to satisfy the VIPs of the club, and make sure they have a stellar party going on at their booth. This role is typically considered a stepping stone to VIP Host. 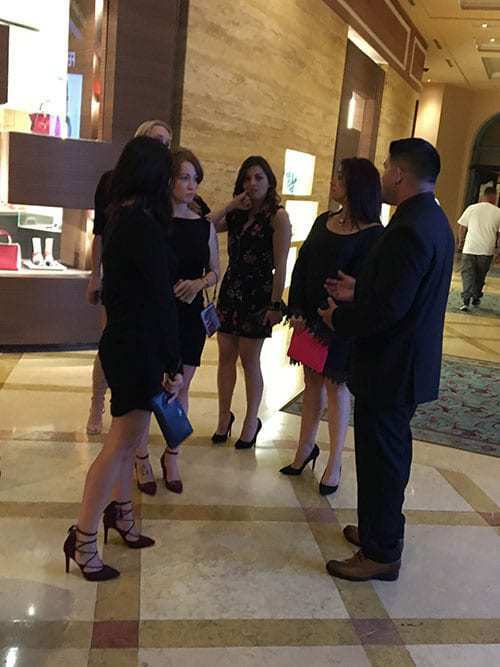 Las Vegas promoters graduate to host in the casino and walk groups in. This is the type you want to deal with, and the category that much of our network falls into. Unfortunately, this is the kind of Las Vegas promoter you rarely meet. They don’t have to go out there and hustle on the strip. These are Vegas promoters who have been in the business for 5+ years have assembled a massive network and loyal client base. This is because they are trusted. They always come through. They always hook it up. For their people they get fast entry, special free drink deals, and extra privileges on certain nights. The club depends on them for their network, and they get what they want. These are the people you generally want to deal with. What is a VIP host? A Las Vegas nightclub host, also known as a VIP Host, is someone whose focus is booking bottle service revenue for the venue.. These are the people you want to see if you’re going big and buying a table in Vegas. Read our bottle service guide to learn more about VIP table pricing in Las Vegas. VIP Hosts are typically given a guest list as well, but they will often give their people to promoters in exchange for their table customers. 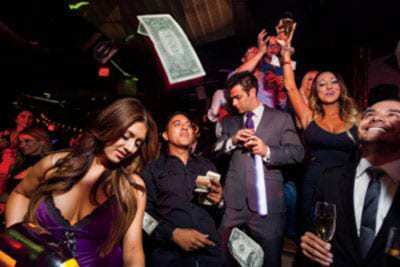 A VIP host in Las Vegas is focused on clients with cash to spend, and are virtually paid to party with them. Vegas hosts are usually those who have worked themselves up from the doldrums of promoting on the street. Others come from sales professions in different industries and have moved over to nightlife. They’ve been in sales a fairly long time and have assembled a strong list of clients with cash. The VIP Hosts are the breadwinners of a nightclub. They are given tremendous power and freedom. If you’re coming to the club looking to spend money on bottle service, you want to deal with the very best. Our people will ensure you get the best deal, best table placement, and best overall experience for your budget and chosen venue. Ready to get in touch with the best and start booking your nightclubs? Leave the stress of planning your Vegas trip to us. Know what clubs you want? Let us know and we’ll have the top people at each personally reach out. Looking for advice? We’ll give you our recommendations based on music preference, desired atmosphere, location, and day of the week. For a truly VIP experience we suggest you take a look at our VIP Packages and Services page. Or get in touch with a Promoter Now VIP Host directly for pricing on our premium services: Hosted Entry (skip the line) and Bottle Service (reserve a table). Have more questions? Fill out our form below and let us know which venues you have in mind, and we’ll figure out an option that works best for your group.